Puppies are small, happy, and adorable. That was my impression growing up. However when I was six years old, I found myself having to challenge this perception. We welcomed a new member into our family that year- a bulldog puppy. He was small- although not for long- and in certain ways he was undeniably adorable. But he was perhaps the grouchiest living thing I have ever encountered. Even at a couple months old he had a permanent look of displeased irreverence for life. We rather fittingly named him Oscar, after Oscar the Grouch. Ecclesiastes 1:18 reads “for with much wisdom comes sorrow; the more knowledge, the more grief.” I always attributed this for his angst, because I found more wisdom in that nihilistic ball of fluff, than I have perhaps anywhere else. When I was seven years old and struggled with the complex psychology of playground dynamics and making friends, I found comfort in the quiet confidence Oscar exuded, even when he was alone. He was completely at ease with himself – regardless of any outside validation. When I was ten years old I developed a love for music and began playing the electric bass. It was bad for a long time. However the low frequency must have been pleasing to his canine eardrums because while the rest of the household would hastily exit the room that I was practicing in, Oscar would walk against the grain, strutting slowly into the room, before collapsing dangerously close to the amp. I could almost visibly see him smiling and nodding along to the out of time rhythm. It was an important lesson for me in that moment- to continue on with something that I am passionate about, be it a hobby, an intellectual pursuit, or anything else, regardless of what other people are doing. He somehow seemed to understand the intricacies that Robert Frost put so eloquently in his 1916 poem, teaching me to take the Road Not Taken. When I was thirteen I encountered trouble with my brother. We were close but he could get under my skin like nothing else. We had recently brought another dog into our family, a young hound dog. He was hyper and aggressive and playful. Oscar, who had since reached the physical maturity his personality had always implied, would mope through the house and the hound would jump at him, trying to bite his ears and push him over and pull him down. But Oscar never yielded to the provocation. He continued on his path, wherever he was headed without so much as an acknowledgment. The hound eventually learned he couldn’t bait Oscar and ceased his harassment. It was an incredible lesson in patience. When I was sixteen, he taught me one last lesson. I woke up one morning to find him lying in front of the amp that we had practiced at together so many times before. He had passed on that night. 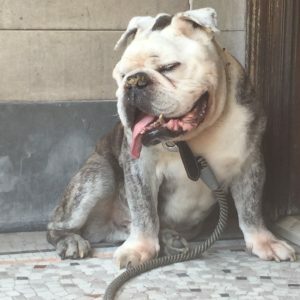 It was difficult to say goodbye, as it always is, but I knew he had lived a bulldog’s life, and lived it well. In this was his final lesson; a life lived to its fullest is a life lived properly and without regrets.